The FAA’s 2011 U.S. Commercial Space Transportation Developments and Concepts: Vehicles, Technologies, and Spaceports report has a section that looks at commercial spacesuits being developed by American companies. One of these companies, ILC Dover, has been building spacesuits for NASA for decades, producing the suits worn on the moon by Apollo astronauts and space shuttle astronauts. The David Clark Company has been around since 1941, producing pressure suits for Chuck Yeager, Gemini astronauts, and the space shuttle program. The third company, Orbital Outfitters, is a newcomer that is designing pressure suits for XCOR’s Lynx suborbital vehicle. The relevant section from the report is reproduced after the break. Contingency Hypobaric Astronaut Protective Suit â€“ David Clark Company, Inc. The Contingency Hypobaric Astronaut Protective Suit (CHAPS) is designed for intravehicular activity (IVA) only. The suit, which weighs less than nine kilograms (20 pounds) and fits in a volume of about 0.2 cubic meters (one cubic foot), protects the wearer from loss of cabin pressure and hypothermia, should an emergency splashdown occur. Use of the CHAPS will be intuitive and produce minimal interface with the vehicle. CHAPS consists of a two-ply coverall, helmet, and gloves. The coverall will accept a variety of gloves and helmets, providing flexibility of mission requirements and other considerations. The coverall also features a pressure-sealing rear entry and soft, flexible joints. In 2010, David Clark continued research and development work on CHAPS, though at a low level. Most of the work has focused on identifying and adapting suit interfaces to whatever vehicle system it is expected to serve. 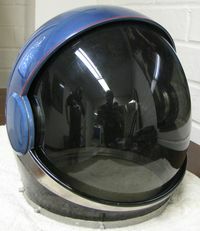 Delaware-based ILC Dover has been in the business of developing helmets and pressure suits since the 1950s. In 1965, ILC Dover was selected as prime contractor for the Apollo space suits, and in 1977 it was awarded a contract to develop the space suits used for the Space Shuttle program. The company also produces protective suits for those working with hazardous materials. ILC Dover has been developing the I-C2 Commercial Launch Suit for potential commercial use, leveraging work from its I-Suit program, started in 1997 under a NASA contract. The I-Suit program determined the state-of-the-art in space suits and pursue improvements based on experiences gleaned from decades of experience. The I-C2 suit consists of a pressure garment with waist entry and a moisture vapor permeable bladder. A liquid cooling garment is worn under the suit for temperature control. The pressure garmentâ€™s outer cotton layer is fire resistant, and it features safety reflectors and hand holds for emergency rescue. The joints facilitate maximum flexibility. The gloves are attached using a typical ring connector around the wrist. The boots are standard issue military-style jump boots, similar to those worn by astronauts during the ascent and descent phases of Space Shuttle flights. A soft helmet is permanently attached to the pressure garment via a soft pressure-sealing closure, and it contains impact-protected communications equipment. Orbital Outfitters, with offices in Washington, DC, and North Hollywood, California, was established to provide space suits for the emerging suborbital tourism market. The company has designed its first suit, called the full pressure Industrial Suborbital Spacesuit (IS3). The primary purpose of IS3 is to protect the wearer from loss of vehicle cabin pressure. 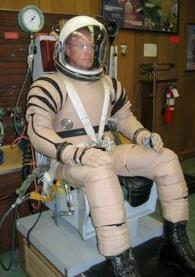 Operational testing of the suit began in 2007. The company has since done significant work in developing IVA suits for orbital and suborbital vehicles and has done component-level suit development work for NASA.